2002 Exiss/ Featherlite 44’ All Aluminum Enclosed Car Trailer. This is the top of the line car trailer of all car trailers. It is all aluminum construction and is very light. There is simply no comparison between an all aluminum trailer and a steel framed trailer. Once you have pulled an aluminum trailer, you will never go back to a steel one. This trailer probably has less than 2000 miles on it from new. It was bought new and used for onsite storage of emergency equipment at a nuclear power plant. They don’t get much cleaner than this. It didn’t even have tie downs in the floor for cars . I pulled this trailer 1300 miles home and it is the best towing trailer that I have ever pulled. The Duramax got 11.1 miles to the gallon pulling this trailer with a 56 GMC truck in it. That is better than it did with the 28’ steel framed bumper pull trailer empty. It has one dent in the right front corner, and few very small dings, It has about 36’ on the floor and about 8’ over the hitch. 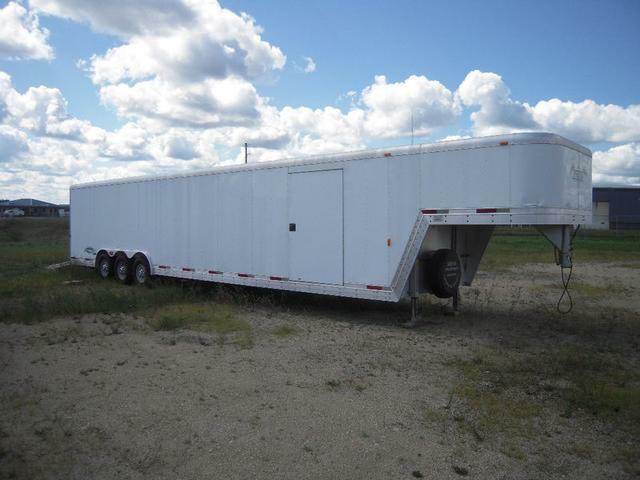 This is a very nice low low mileage lightly used serious race car trailer ready to customize to your liking, or just use it like it is. Sold, and it’s off to Oklahoma with Chris to go racing.